Gary and Clyde both harvested beautiful Gold Medal Axis. So was the hunt a 100% success? I say yes! 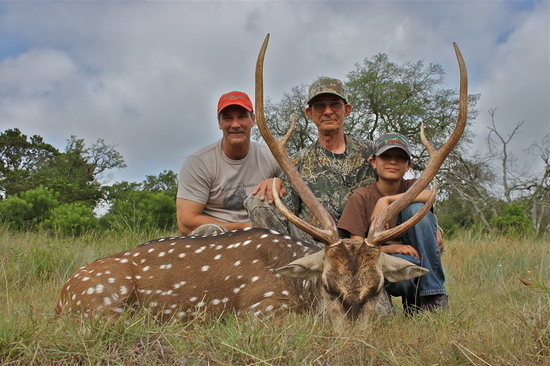 Anytime 3 generations can spend quality time hunting together it’s a success. And Coby……like Brad said, WE WILL FIND YOUR BUCK! Keith Vanecek (Owner/Guide of Trophy Exotics) slams a .270 barnes triple shock into this giant Aoudad. Late afternoon on June 8th Keith was taking fellow guide Tristan Rusk fishing for some table fare. As they eased down to the lake Keith spotted this Aoudad about 250 yards away. “I noticed he had a limp”, Keith said. After careful observation both guides agreed the animal needed to be harvested. Keith took steady rest and fired. Keith connected with this 12 year old Aoudad @ 246 yards. After observing the animal Keith and Tristan discovered this Aoudad had a lame foot rendering it helpless against predators like Coyotes. This magnificent Aoudad had 13″ bases and measured 32″ long. V Bharre Ranch is known for it record class Aoudad. 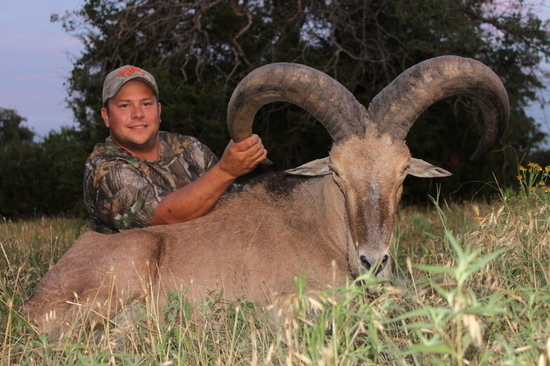 So if you are looking for a Giant Aoudad like this….Book a hunt today! 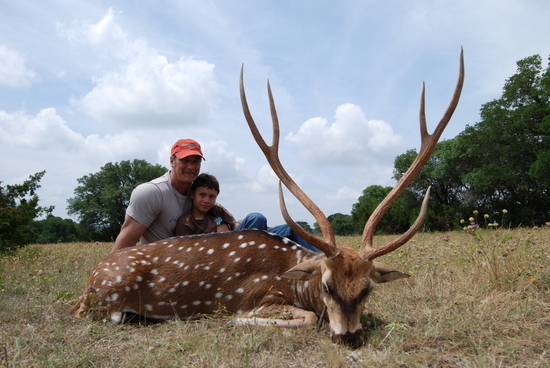 Hunter Michael Scoggins from Houston, Texas harvested 2 world class blackbucks. First blackbuck photograph on right was harvested with a Parker Crossbow. This blackbuck is the pending SCI crossbow world record. 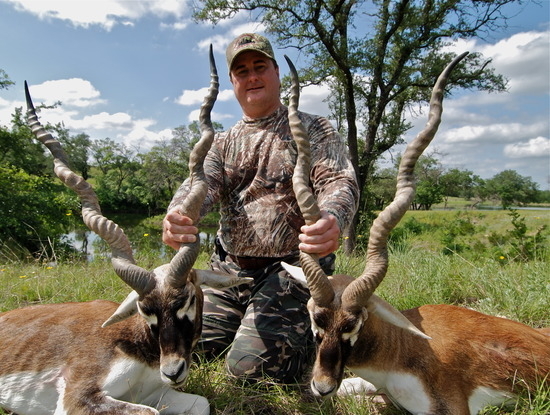 Blackbuck photographed on left was harvested with a Parker compound bow. This blackbuck unofficially scored 80 1/8 ranking it #2 “All Time” and #1 Bow. Super congrats to Dr. Scroggins on 2 world class blackbucks on V-Bharre Ranch. Well magic happened last night at V-Bharre Ranch. Former Mets centerfielder Jose R. harvested a 32” Aoudad with his 300 win mag. Congrats to his guide Brad and to Jose for a super trophy Aoudad. Great job guys!